Uh~la~la~.... Look quite clear but actually very spicy. More spicy that the news online. But ......sedap leh...at least according to Mamarazzi la. 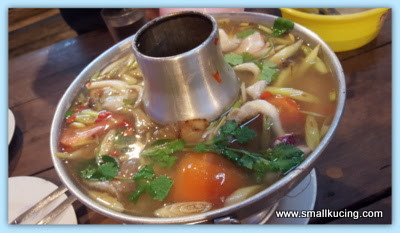 The Tom Yam soup tasted so nice to eat with rice. Can have at least two plates of white rice with this. Added with the Kerabu Chicken Feet. Syok max. The crunchy skin and the sourness of the lime. No cili padi here. Asked them not to add. Papa wanted the grilled Cockles but that evening they were out of that. 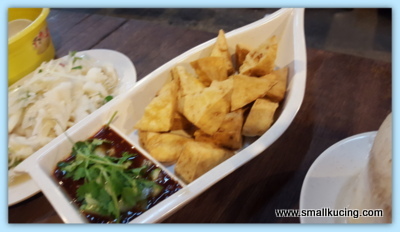 He had this fried taufu instead. It's another dish that Papa likes from this restaurant. Am still not that adventurous. I ordered Cantonese Fried Noodles instead. Not much noodles in this plate but they are sure very generous with the vegetables and gravy. 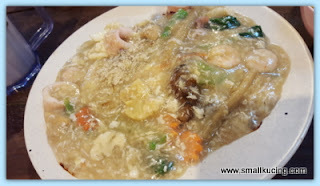 After I had the noodle, Papa and Mamarazzi had the mixed seafood vegetable from here pulak. Nice place to have dinner. The soup sure looks delicious!! Looks good leh. Must have cili padi only syiok hehe. Ya loh news very spicy these days. Beh tahan but what can we do. First time I came across a Thai restaurant served Cantonese Fried Noodles but it's good then cause for those who can't tahan spicy, have another option to choose from. Wah! you guys went to eat there again after 5 times?? I suspect Kaldip has a share there. Why don't you ask papa? I went there twice and I think the food is quite nice with reasonable price. It is funny to know that you ate Cantonese Fried Noodles there and not Pad Thai instead. I have eaten chicken wings, breast, legs, but never chicken feet! How many times have you been here? Never brought me along pun. Tsk! Tsk! You eat chicken feet? Or your papa and mama enjoy that - lots of collagen, will stay looking young wor...but no, thank you. LOL!!! Yaloh. Look clear but it is spicy soup. Look can be deceiving. Sekali pandang, yummzzz, I like the tomyam and kerabu chicken feet.. 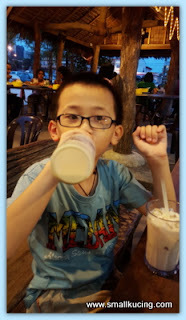 Sour sour, very hoiwai oohhh.. Oohh, biasa la, wat tan noodles for kids, I think all kids are the same, both my boys too.. Everywhere they go, frid rice or wat tan noodles with egg or starchy tofu, sure can't go wrong.. Killing me!! Love the spiciness of the tom yam and how can I say no kerabu. why you always go Kluang? LOL.....can only spam in LRT ah...cham lo..
no joke at all.. the authentic tomyum can look just as clear as your fish ball soup, but it can be 100 times hotter until your face gets red and smoke piping out from your mouth, nose and ears dei.. smart Small Kucing for not touching that but stay with his own comfort food.. haha!! aiyoh no grilled cockles then gotta order the fried toufu pulak, both like very big difference hor?? good also lah, first choice don't have then no need to think, straight away second choice rather than having to be indecisive between the two choices hor?? or maybe can order both if available, haha!! Kinda hard to get the cockles there. Theirs are very big size one. Hi Small Kuching, its me, Lee from Canada. How you doin'? I've been MIA long time so just checking in on old friends. Holy Smoke! That boy of yours has really grown! Still remember that cute botak young feller of few years back. This young handsome guy of yours going to grow up to live to eat. And sure a food gourmet. Best regards. Hope this finds you well. Thai cuisine makes me drool! 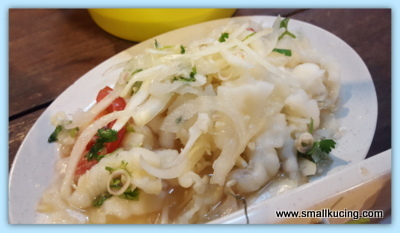 Long time have not eaten these yummy, appetizing food! maybe put in salt water kot? If it is spicy... my Hubs would love it.